JP Gillespie skat­ing Trackmasters. Photo by Andrew Maholsic. My home town of Buffalo recently had a spot check arti­cle pub­lished that JP of Sunday Skateshop where he runs down 6 famous Buffalo Spots old & new. I didn’t get to skate all of these as a few of them were after my time in Buffalo or plain old just out of my skill bracket. I’m really ich­ing to skate Trackmasters again now after this. The main photo kick­flip in the arti­cle at the main place mall is pretty gnarly. There is a gran­ite slab right after you land that if you don’t turn away from it you could get pretty messed up. Aside from drop ins, the 1st major thing I remem­ber going down on that thing was Ricky O’s man­ual to ollie in. Go check the arti­cle to read about Dave Weaver’s gnarly kick­flip into that thing. Rest in Peace Dave! Go watch his orig­i­nal edit from Sunday’s “Whatever the Weather” video after you read that inter­view and spot check to see that amaz­ingly scary kick­flip. Do we really care that he didn’t com­pletely roll away clean know­ing he went and did it after going through Chemo? Hell naw. Thanks for help­ing keep Buffalo on the map for skate­board­ing, JP! It’s grown so much since I left. 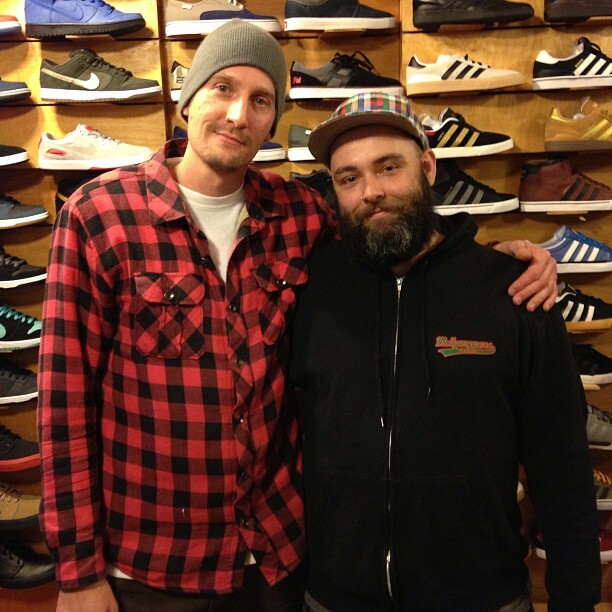 JP & I two and a half years ago on a visit to Sunday Skateshop.